Friday, April 19 – Egg stuffing party, American Legion Post, 2104 N.E. 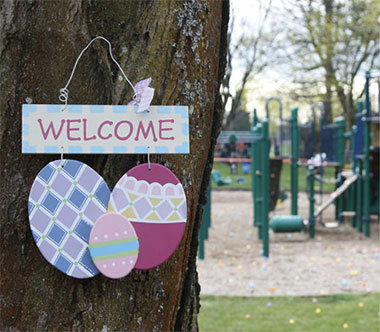 Alberta St., 5-8 p.m.
Saturday, April 20 – Hiding eggs Fernhill Park, 8-10 a.m. 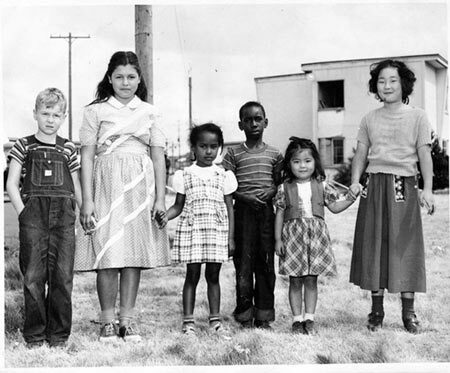 The 2019 Vanport Mosaic Festival returns for its fourth event May 21-June 2, organized by community-driven nonprofit Vanport Mosaic. “Through exhibits, documentary screenings, tours, performances and dialogues, we will celebrate the lessons of resilience and resistance as defined and told by historically oppressed communities,” reported the festival’s Facebook page. The multi-disciplinary festival has received the Oregon Heritage Excellence Award, the Spirit of Portland Award and the Columbia Slough Watershed Council’s Achievement Award. Returning sponsors and funding sources are Oregon Historical Society, Portland Bureau of Emergency Management, Multnomah County Drainage District, Port of Portland, Regional Arts & Culture Council and Multnomah County Cultural Coalition. The festival is seeking more sponsors, funders and volunteers. For details, contact Info@VanportMosaic.org or visit Facebook.com/events/318232912147588. Concordia University (CU) in February received the largest financial contribution in its 114-year history. The $5 million grant from the Robert D. and Marcia H. Randall Charitable Trust will establish the Robert D. Randall Endowed Chair for Business and Technology. According to university officials, that chair will expand the CU School of Management’s focus on an innovative business education and technology program. “This gift will be transformative in advancing Concordia’s commitment to developing ethical and impactful leaders,” said Michelle M. Cowing, Ph.D., school of management dean. The focus for the business & technology program is driven by the unique makeup of the regional economy, she added. It’s one fueled by homegrown businesses as well as global enterprises. A new clinical model and technology curriculum will be co-designed with regional business leaders working in small and large businesses alike, startups and the growing tech sector. According to the dean, engaging students in a variety of clinical experiences and a strong technology emphasis will prepare future leaders who are able to help businesses respond to ever-increasing economic and technological change. The $5 million grant kicks off a university campaign to raise an additional $1.25 million. That’s also for the university’s business program, which is now named the Randall Fellows Clinical Program for Business & Technology. A few years ago, the city of Portland solicited feedback from the Concordia Neighborhood Association (CNA) about the 20s Bikeway project. One of our responses was to request diverters at major streets in our neighborhood – such as Prescott and Killingsworth – to prevent cut-through car traffic from turning onto the narrow one-lane streets on which the 20s Bikeway is routed. That practice can stress out potential bicyclists on the route who may be interested in bicycling more, but are concerned for their safety. But we were told the city would only install diverters on streets with higher than a certain amount of automobile traffic. They then informed us they had changed their policies, and now they only installed diverters on streets with sufficiently high traffic volumes. They measured the traffic volumes in Concordia, and the single-lane streets of the 20s Bikeway project didn’t have enough cars to meet their new standard (for two-lane streets), so therefore they didn’t feel diverters were necessary. I’ve told this story to folks around the city. In doing so, I’ve found a coalition of folks who also want to see physical diversions installed to protect our investment in the bicycle greenway system and keep it safe for bicyclists of all ages and abilities. Together we developed a communitybased policy proposal called “Diversion on Bikeways as Urban Form.” The basic concept is that the urban form of bicycle greenways should include diverters to ensure that they are local-access-only for motor vehicles, while allowing bicycles to continue as through traffic. The idea is the same as the existing urban form standard for sidewalks that includes wheelchair ramps where sidewalks meet street intersections, and for driveways that includes ramps and aprons where driveways meet streets. This policy proposal is endorsed by CNA, the Northeast Coalition of Neighborhoods, SE Uplift and BikeLoudPDX. Those groups presented this policy proposal to Portland Bureau of Transportation (PBOT) staff in December. We were told PBOT will take no further action until it fills its new greenways coordinator position. Once this policy is adopted officially, it includes a strategy to deploy temporary installations initially to test each diverter location. It advises using kiosks to allow neighbors to provide feedback to PBOT, so temporary installations can be moved or adjusted, retested and perhaps moved and tested again, before being made permanent. This sort of iterative public feedback loop is proposed as a more effective version of public engagement. Traditionally, public engagement involves discussions in meeting rooms far from actual installation sites. Feedback thus received comes from people who haven’t yet interacted with the physical diversions in question as a part of their daily travels. We look forward to working with the city to test this new policy to help encourage more bicycling in Portland – in a way that is respectful of and responsive to the concerns of neighbors and roadway users. Garlynn Woodsong lives on 29th Avenue, serves on the CNA board and is an avid bicyclist. He also is a dad who is passionate about the city his son will inherit. He is the planning + development partner with Cascadia Partners LLC, a local urban planning firm. Contact him at LandUse@ ConcordiaPDX.org. Claire Alexander (front) practices shutting off a natural gas meter while Ann Hall looks on. 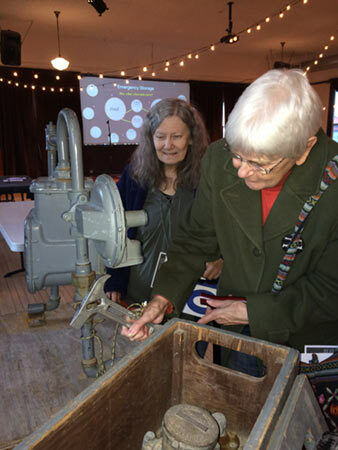 The January Neighborhood Emergency Preparedness Expo offered hands-on learning along with opportunities to inspect emergency supplies, chat with experts and hear from a panel about seismic retrofits. “When you have something that’s unregulated and there’s tons of fear, there are all sorts of placebos,” said Tim Cook, NW Seismic structural consultant. ollowing the event, Tim explained there’s no code for installing anchors to hold an existing home to its foundation during an earthquake. New home construction codes offer some reference for builders. And forensic engineering studies of homes damaged by earthquakes offer evidence-based criteria for optimum retrofit methods. “It’s not rocket science, of course, but there are a lot of nuances,” he reported. Tim has been involved in the retrofit industry for six years, now working for a company that traces its roots to the Spring Break Quake in the 1990s. “There’s no education required to do seismic reinforcement. We see a lot of engineering that people are paying for that isn’t going to work,” he said. A survey in the San Francisco Bay area – ground zero in terms of industry knowledge – found 80 percent of the residential retrofits inspected probably won’t be effective. “In this way, this is really embarrassing to the industry,” Tim noted. Websites can provide both good and bad information. Tim pointed to the site maintained by the city of Salem Building & Safety Division. It recommends hardware designed to resist uplift forces generated by wind, rather than the lateral forces generated by earthquakes. “If city inspectors don’t understand this, why would contractors go out of their way to learn the basics?” Tim asked. Research contractors’ websites for information on their experience, methods and recommendations. Take note if they provide simple statements about earthquakes and nothing about how all the components fit together. Research Tim’s company website at NWSeismic.com to learn the basics about retrofitting. Attend a free workshop. Multnomah County Library invited NW Seismic to present them. The workshops are geared to homeowners – some of whom are DIYers and some who just want to be informed consumers. For details, visit MultCoLib.org/events/seismicretrofitting. Below are the poetry efforts of three Faubion School fourth graders in Mr. McGee’s class. clouds are nice and make shapes in the sky. I don’t feel that bad. the people who are feminists. Thank you. February’s not a time for thinking of sunscreen or how to avoid sunburn. Scattered sunny days are celebrated with bare arms and legs. No need to cover up, scout for shade or sunscreen. Unfortunately, the makers and advertising teams of major brands of sunscreen project the illusion that sunscreen is primarily used to protect pale skin from the sun’s damaging omnipresent rays. Sunscreen protects everybody’s skin. All shades of skin – from pale to dark – need a healthy layer of sunscreen when summer’s hot sun shines. That’s right, people with dark skin do sunburn. How do you ask your dark-skinned neighbor, nice person, African American, which sunscreen product do they use? Or how do you respond if your child asks you if a dark-skinned friend needs to put on sunscreen before they race off to the swings? You might feel awkward about asking. You might feel embarrassed by the question. These examples, on the surface, might appear to fall in the category of cross cultural differences. Closer examination reveals that the questions are actually about skin care and avoiding sunburn and skin cancer. We all ask questions to show concern or interest. Showing concern or interest in the well-being of others builds friendships and community. Asking a friend, who happens to be of darker skin than yours which sunscreen they use, for example, might be received well or not. You and your friend might launch into a lively discussion on the pros or cons of sunscreen use. At the end of your lively conversation, you both might admit your awkwardness with the topic, followed by laughter. Before asking a potentially awkward question of a friend or anyone, have a mindset of patience – patience with yourself and with the awkwardness. We’re all under one sun. Thanks for asking. Karen Wells is a retired early childhood community educator, health and safety trainer. Oregon’s wet, cold winters bring Concordians inside our homes craving the crackling warmth of our fireplaces and woodstoves. Data from the U.S. Fire Administration show the threat of winter fires is real. I am a burn specialist who cares for survivors of burn injuries. I am also a person who experienced the humbling reality of my own home catching fire. Thank you to Portland Fire & Rescue Station 14 in Concordia for saving my life and home. Nationwide in 2017, one person died every three hours and 20 minutes in a house fire. Other fires caused a death every two hours. 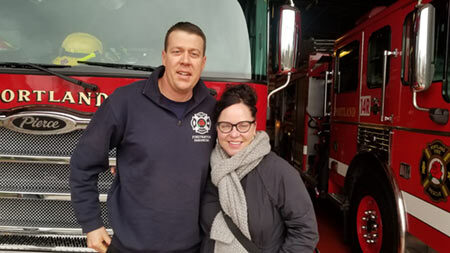 According to the National Fire Incident Reporting System, heating equipment is the culprit of one in four Oregon winter house fires and a leading cause of winter house fire deaths. Another leading cause of house fires is cooking appliances. Evening – 5 to 8 p.m. – is the most common time for these fires. So how can we protect our homes and loved ones? Use nonflammable screens in front of the fireplace opening to prevent sparks from jumping out, unwanted material from going in, and help prevent the possibility of burns from touching the hot metal or glass. My office is full of new walkers who toddle over and land palm first on a hot metal or glass door. Establish “no” zones. Wood stoves need at least 36 inches of adequate clearance from flammable surfaces – plus kindling, paper and décor – and proper floor support and protection. Wood stoves should be good quality and should be lab tested for safety. It should be placed on an approved, noncombustible stove board or hearth to protect the floor from heat and hot coals. Chimneys should be inspected yearly, and cleaned if needed, especially if they have not been used for some time. • Never, ever, use flammable liquids to start or accelerate any fire. Ever. Never burn charcoal indoors. It can give off deadly amounts of carbon monoxide. Place space heaters at least three feet away from anything that can burn: furniture, blankets, curtains, paper products, etc. Choose space heaters that turn off automatically if they tip over. Buy and use only space heaters that have the label of a recognized testing laboratory. Install smoke and carbon monoxide alarms on every floor – even the basement – ideally outside every sleeping area. Replace them every 10 years. Most victims of fires die from smoke inhalation, not from burns. Theresa McSherry FNP-C is a burn specialist, board certifed family nurse practitioner. She pract ices at The Oregon Clinic Surgical Burn Specialists, Legacy Emanuel Oregon Burn Center and the Legacy Wound and Burn Clinic. Theresa has lived in Concordia for 25 years and has loved watching it grow into the vibrant community it has become. If it seems like the Portland Residential Infill Project has been dragging on for years, that’s because it’s true. The project began in autumn 2015. It will be four years later – autumn 2019 – before the project is likely to be adopted, at the very soonest. So, what’s going on with it? Ever since last summer, the Portland Planning and Sustainability Commission (PSC) has been reviewing the staff proposal from April. Public comment was taken until mid-summer. Since then, PSC members have been voting on changes to recommend. The most recent action was Dec. 11, when the PSC received a staff briefing on an updated economic analysis of the project. It reflects the PSC’s tentative amendments to the proposed draft from September, when it directed staff to revise the proposal to incrementally increase floor area limits for additional units. This change would allow more housing options and expand the area within which those options would be allowed to all R2.5, R5 and R7 zones, with some exceptions for natural resources and hazards. The PSC’s revisions would significantly increase housing production in the R2.5, R5 and R7 zones across the next 20 years. An additional 24,000 housing units would be produced, accompanied by only a modest increase in demolitions – 117, which is fewer than six a year citywide. The incremental increase in floor area ratio (FAR) allowances for additional units provides a bigger incentive to build housing types other than singlefamily residences. FAR is the ratio between the floor area of the building and the area of the parcel that it sits on. The new missing middle housing types – duplexes, triplexes, fourplexes and additional auxiliary dwelling units (ADUs) – have smaller unit sizes, which are an average of 56 percent less expensive than new single-family houses. These reduced housing costs help to provide housing choices for people across a broader range of the income spectrum in more areas of the city. The PSC is scheduled to receive a briefing on staff’s revised proposal, which should reflect the changes requested to date by the PSC. The PSC is scheduled to vote on recommendations to the city council in March. City council is anticipated to begin public hearings on the project this summer. No council vote on the project is yet scheduled, but my guess is such a vote will not occur until the school year begins in the autumn, at the very earliest. From the perspective of the Concordia Neighborhood Association – which has requested that the Portland Residential Infill Project include allowing fourplexes to maximize the potential for reduced housing costs in our neighborhood – the positive news is that the PSC agrees and has requested that fourplexes be added. The additional good news is the economic analysis confirms that adding fourplexes – and scaling the allowable FAR with the number of units – will result in more, lower-priced units than either the status quo or staff’s original proposal.